One of the most common reasons people tell me they don’t want to compete is “I don’t have the right gear”. There is a misconception that you must have super tricked out race guns to even show up. While it is true that equipment can help your score, without the requisite skill set it does not really matter. Competitors in matches are sperated into divisions based upon the equipment and accessories they use; you are only really competing against people with similar equipment. 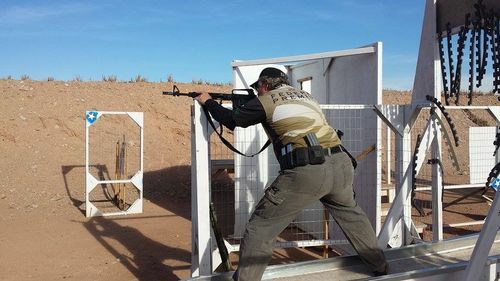 Limited, aka Tac-Limited or Tac-Iron, is probably the best place for most people to start in 3-Gun or multi-gun competition. Chances are if you are reading this you already have the gear that fits in this division. Home Defense/Trunk Gun doing double duty. 14.5″ Barrel with Permanent Flash Hider. Note 45 round magazine and Aimpoint M4S. As we moved into the 2010s participation in Iron Sight or Tac-Iron divisions steadily declined. 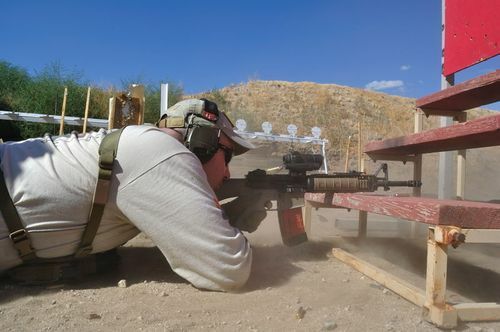 Using iron sights is generally harder and slower than any kind of optic. Few people used red dots sights in Tac-Scope division because they were seen as a hindrance for long range stages. The most common setup in Tac-Scope was an ACOG with offset irons, or a low variable power scope. Outside of competition red dots like Aimpoint and EOtechs were the most common sights people had on their AR15 carbines, and in the military the Aimpoint was a general issue optic as the M68 to many service personnel. Law Enforcement overhwelmingly uses red dots as well. With Iron Sight based divisions dying a slow death, the decision was made by many matches to allow 1x or red dot sights on rifles. In many cases the old Iron Sight division was renamed Limited. Iron sights could still be used but they would compete heads up against no magnification optics. So now if you have a home defense or duty rifle with red dot, you have a place to easily participate and be relatively competitive. If you’re going to use anything other than an AR15 for your rifle, this is also the easiest division to be competitive in. Throw a red dot on an AK, a Sig, a SCAR, or any other semi auto rifle and how good the iron sights are is now irrelevant. It is easier to be competitive in this division if you’re not a full time competitor because the equipment rules attract other casual competitors to use the gear they already own. When I’m testing new guns for reviews, Limited is generally the division I like to do it in. The downside to Limited division is lack of magnification on long range stages. You will need to practice shooting out to 300 yards on targets that are 4MOA at range. Put in the time getting a good zero before the match; for most red dots and bore offset heights 50 yards is a good range to zero at. Use a BDC calculator to understand where your hits should be at different ranges and then verify by practicing at those distances. The range I sight in at has steel targets for the public to use at 200 and 300 yards. This makes confirming point of aim vs point of impact at these distances easier. If you don’t have access to a range like this you’ll have to figure it out on the clock. Being able to read your impacts relative to the target is critical to make adjustments on the clock. Good vision or good corrected vision helps A LOT as well. I’m going to use the Superstition Mountain Mystery 3 Gun Match rules in discussing Limited division. Please understand that these rules vary slightly from match to match. Always check a particular match’s rules before attending. 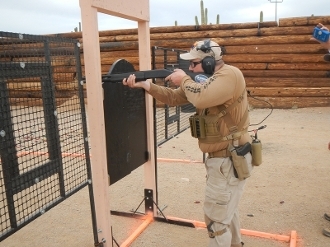 SMM3G is perhaps the oldest continually running 3 Gun match so they often set the trend for others to follow. 3.1 Handgun ammunition shall be 9mm Parabellum (9x19mmNATO) or larger, unless otherwise stipulated under equipment division rules. 9mm handguns are generally best for 3-gun due to higher capacity. It is rare to encounter scoring systems or targets that reward using larger calibers. Safe-action pistols are also often preferred because grounding them simply means placing them in a dump box rather than having to turn a safety back on, decock, or clear the pistol entirely. 3.2 Rifle ammunition shall be .223 Remington (5.56x45mmNATO) or larger, unless otherwise stipulated under equipment division rules. .223 is by far the most common cartridge in this division because of its low recoil. 3.3 Shotgun ammunition shall be 20 gauge or larger,unless otherwise stipulated under equipment divisi on rules. 3.3.1 Birdshot must be no larger than #6 birdshot, and be made from lead or bismuth only. Iron/steel/tungsten birdshot is unsafe and prohibited. Most competitors use 12 gauge. 20 gauge is generally used by female or junior shooters due to it’s lighter recoil, and the shells are easier for them to hold and use with competition reloading techniques. 3.4 Ammunition containing tracer, incendiary, armor piercing, steel jacketed or steel/tungsten/penetrator core projectiles is unsafe and prohibited. This is where you may run into trouble using 7.62x39mm, you need to make sure that your projectiles do not attract a magnet. 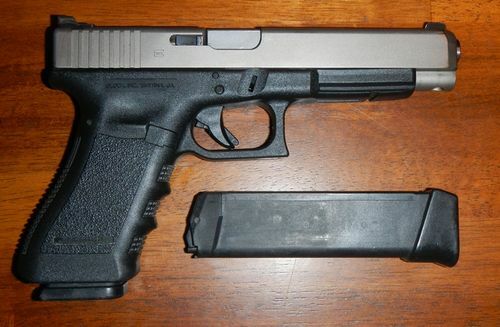 Longslide models like the Glock 34 are often preferred over normal duty sized handguns for their longer sight radius. This is not to say you need one to compete, you can compete and be fairly effective with compact models down to Glock 19 size. I encourage people to compete with their carry guns. When I competed with a 34, I also carried an identical copy daily. 5.4.2.1 Handgun holsters must be a practical/tactical carry style and must safely retain the handgun during vigorous movement. Semiautomatic pistol holsters must completely cover the trigger, and must cover the slide up to ½” below the ejection port. Revolver holsters must completely cover the trigger and the cylinder. The belt upon which the handgun holster is attached must be worn at waist level. Shoulder holsters, cross draw holsters and “race” holsters are prohibited. Your typical carry or duty holster is specifically allowed. Confirm with match staff that apendix holsters are ok just to be sure if thats what you use. Holsters with retention like a Safariland ALS can be a benefit at more physical matches so you do not drop your gun. 5.4.2.2 Electronic sights, optical sights, extended sights, compensators, muzzle brakes or barrel porting are prohibited. 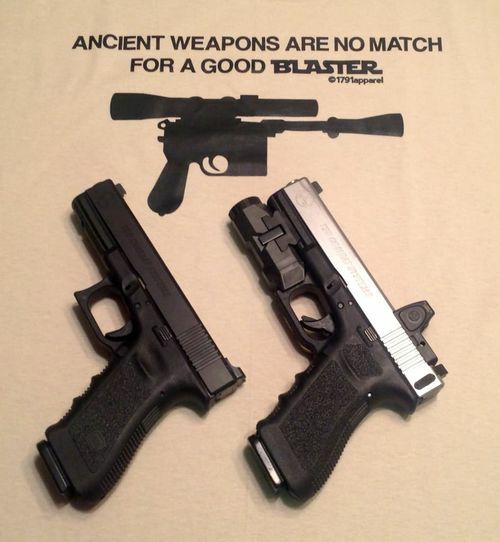 The Glock 17 on the left would be legal for Limited, the Glock 17 on the right would be legal in Open division. 5.4.2.3 Magazine length may not exceed 170mm in thecase of single column magazines, and may not exceed 140mm in the case ofstaggered column magazines. +2 to +5 extensions are common on double stack handguns. 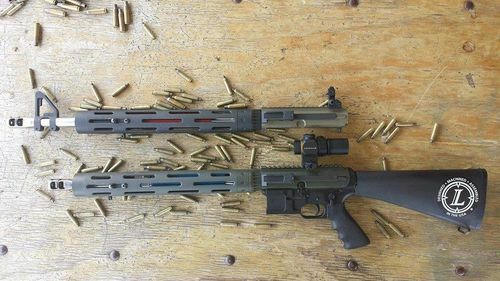 Competition Rifle or Defense Rifle? It could be both. 18″ barrel free floated barrel with FSC556, match trigger, Aimpoint T-1 2MOA, Surefire X300. Dedicated Competition Rifles for Limited Division. Note on the Iron Sight upper the front sight base is as far forward as possible for maximum sight radius. The muzzle brakes are designed for optimal muzzle jump/recoil control without regard for noise level or flash. The optic is a Leupold Prismatic 1X. 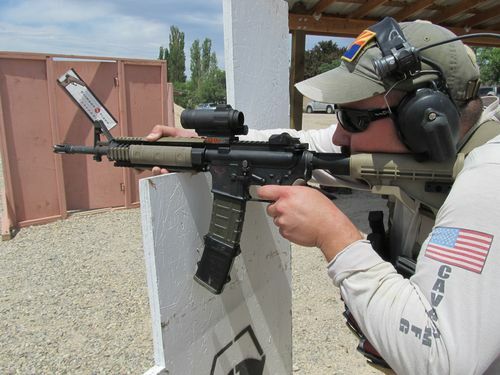 Sterling White with his Limited Rifle: JP SCR-11 equipped with Leupold Prismatic. Kurt Miller has been competing in multigun for a long time. He still uses Iron Sights in Limited division as a point of pride (and he still places well and wins). 5.4.3.1 Not more than one (1) non-magnified electronic or optical sight is permitted. Electronic or optical sights originally designed to be capable of any magnification (whether used or not) are prohibited. Aimpoints and Eotechs can be competitive in this division. I prefer using Aimpoints myself. Top tier competitors often use 1x sights with adjustable focus like the Leupold Prismatic or Vortex Spitfire. They get a crisper sight picture which helps on long range. 5.4.3.2 Supporting devices (bipods, etc.) are prohibited. Bipods are decreasingly useful at 3 Gun matches due to stage design, there is usually somewhere to support off of. Even in open division we almost never use them. Monopodding on a magazine in your rifle is allowed. 5.4.3.3 Compensators and muzzle brakes may not exceed 1 inch in diameter and 3 inches in length (as measured from the barrel muzzle to the end of the compensator). 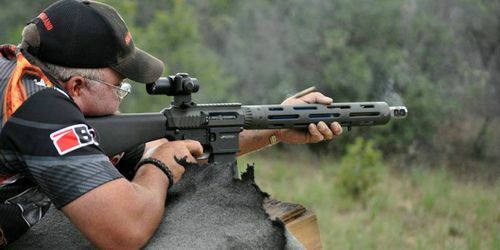 Sound suppressors are not considered to be compensators or muzzle brakes. Most commercially available muzzle devices including the Suarez International Kompressor I currently use meet these dimensional requirements. You do not need a comp to compete, but they do help most of the time in most match environments. MK17S SCAR-H. Typically .308s are used in Heavy Metal or He-Man divisions, but if you don’t have a .45 pistol you can use them in any other division. It will just be harder to place as well with lower capacity and more recoil. As long as your rifle can shoot 3MOA or better (preferably 2MOA), you can use it successfully in 3 Gun. The smallest targets we shoot are 4MOA at range. I would probably not use an AK at a match that had shooting past 200 yards. 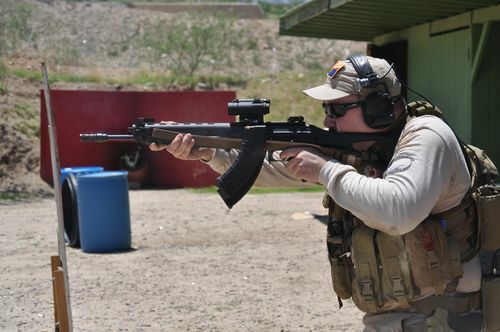 The Sig 556R has better accuracy and can keep up with peer level shooters equipped with AR15s. 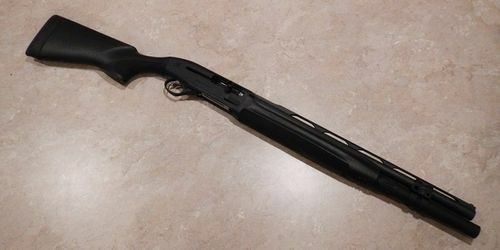 Benelli M2 Field 24″ with 9+1 Capacity (can only start with 9 loaded). 3 Gun Shotguns are something between a hunting shotgun and a tactical shotgun. Chokes are desirable features to make birdshot more effective at knocking over steel. Benelli M2 Tactical. The 7+1 Capacity can be a liability for match purposes as clusters of targets are often presented for the 9 shot division legal capacity, with a smaller magazine tube you will find yourself doing more standing reloads or reloading more proactively. The ghost ring sights are not a liability if you shoot with both eyes open, and they can help on slug targets (maybe 1-5% of shots fired.) If all you have is an 870 or 500/590 by all means come give it a try using what you already own. 5.4.4 Shotgun 5.4.4.1 Only tubular magazines are permitted. Until magazine fed shotguns are sold at Walmart, mag fed shotguns will be relegated to Open division. 5.4.4.2 Electronic sights and optical sights are prohibited. Vent ribs with bead sights are often preferred by competitors for speed on close range steel and on flying clays/moving targets. 5.4.4.3 Supporting devices (bipods, etc.) are prohibited. I’ve never seen anyone use a bipod on a shotgun outside of slug targets at 125 yards at Ironman many years ago. This simply is a non-issue. 5.4.4.4 Barrel devices designed/intended to reduce recoil or muzzle movement (e.g. compensators, barrel porting) are prohibited. Hopefully you didn’t buy a ported 870 or 590 with a breacher brake, if so welcome to Open division. 5.4.4.5 Speed loading devices and/or detachable box magazines are prohibited. 5.4.4.6 Not more than nine (9) rounds total may be loaded at the start signal, unless otherwise stipulated in the stage briefing. It is common for people to have 10-12 shot tubes that they fill up all the way after the buzzer goes off. Some matches limit capacity to 9 rounds period. Check the specific match rules before going. If you don’t own a shotgun at all consider one of the out of the box ready to go shotguns for 3 Gun like the Beretta 1301 competition. Mossberg 930 JM 21″ Model 8+1 Capacity. The one match specific piece of equipment you may actually need is some form of shell caddy system. I’m still using the California Comp Works style shell caddies (mounted to a vest) because I feel they are more practical and durable. Other more competition specific systems like Load-2, Load-4, or Twins, are no doubt faster but require more practice and more fine motor control to use correctly. Sterling’s 3-Gun Rig. Safariland ELS Belt with Taccom Dueling Dueces shell carriers. He also has California Comp Works caddies at the rear. Again you don’t need all this gear to get started. Come out with what you have to a club level event and start learning by participating. You will know when equipment is holding you back and it is time to upgrade. Or you may decide to just uses matches as a practice venue for your martial shooting skills and stick with your self-defense/duty gear. Thanks to Sterling White for getting me pictures of his dedicated competition rigs for this write up and sharing his experience with me as a top-tier Limited division competitor. 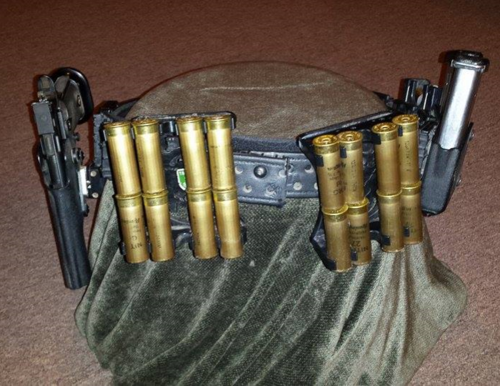 This entry was posted in 3 Gun Divisions, Competitions, Gear, Industry Insiders. Bookmark the permalink. Reblogged this on Discover Practical Shooting.